2 drawings on paper, lined and laminated (1 sheet) : ink, watercolor ; top image 3.25 x 4.75 in., bottom image 3.25 x 4.75 in., on sheet 9.375 x 5 in. 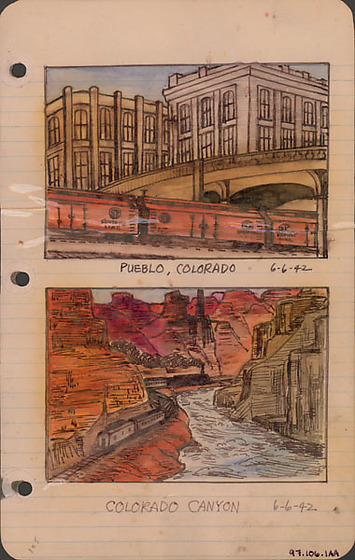 Ink drawings with watercolor in hues of orange, blue, brown, gray of train passing through Pueblo, Colorado and Colorado Canyon on June 6, 1942. Both drawings have black line border. Top watercolor drawing depicts an three orange cars of the Santa Fe Line train passing under a Pueblo city bridge in foreground ; two gray and tan buildings rise in background under blue hued sky. Bottom watercolor drawing depicts gray train billowing black smoke as it winds through orange and red Colorado Canyon alongside blue rapids of river. Drawing 97.106.1AB on verso of same sheet. Written in black ink, below top image: Pueblo, Colorado 6-6-42. Written in black ink, below bottome image: Colorado Canyon 6-6-42. Written in pencil, lower left corner: 105.